In 1999, the libertarian party helped transform American politics by launching a campaign that ultimately sent hundreds of thousands of e-mails to the Federal Deposit Insurance Corporation to protest its proposed “know your customer” banking regulations. The FDIC withdrew the rules, and the era of digital politics was born. Roughly a decade later, social media propelled “birtherism” to the forefront of the national conversation, reinstating nativism as an active ideology in the United States. In 2009 came the Tea Party movement, followed by Occupy Wall Street in 2011, both of which drew on new online organizing mechanisms to build solidarity networks around a particular analysis of social reality. The question for students of American politics now is whether these changes can drive a fundamental realignment of our political parties. Transformations in communications technology have made it more possible than ever before for dissenters from the Democratic and Republican parties to find one another and to form sizable communities of interest. The result is lowered barriers to entry for the work of political organization, with consequences announced daily in headlines about the 2016 presidential campaign. Insurgent candidates in both parties have drawn on the organizational power that has developed over the past decade within ideologically defined communities: Donald Trump has summoned the anger and xenophobia of the birthers, Bernie Sanders has channeled Occupy’s critique of rampant inequality, and Ted Cruz has marshaled the forces of the Tea Party universe. By attaching other groups of voters to their original, more ideologically concentrated constituencies, these candidates have achieved greater success in their respective primary campaigns than anyone thought possible just one year ago. Regardless of whether they succeed in taking over their parties, these new coalitions have the potential to remake American politics if either the insurgents or the party faithful are driven to seek refuge in existing third parties or to create entirely new ones. For the 2016 campaign at least, that latter possibility is already foreclosed, so a takeover (hostile or otherwise) of a third party seems more likely—both the Libertarian Party and the Green Party can place candidates on the ballot in a significant number of states. Even so, our first-past-the-post electoral system makes it very hard for third parties to challenge the top two. Barring the emergence of new habits of collaboration and alliance formation among small parties, only a fundamental change to our system of voting—the introduction of proportional representation, for example—would allow for a more fluid political system to develop. It is easier than ever for dissenters from the two major parties to find one another and form new coalitions. Speculating on what the future holds for America’s political alignment requires thinking through a complex array of factors: voting rules, political egos, the time horizons of charismatic leaders, questions of succession, the intensity of various ideological commitments, and a famously mutable public opinion. What we are most likely to see is more of the new normal: incredibly bitter fights among plurality-sized groups for total—if temporary—control of one of the major parties. Will this also worsen gridlock at the national level, thereby exacerbating the intensity of those intraparty battles and further destabilizing our political system overall? If these dynamics play out simultaneously in both parties, the most unified side will triumph. 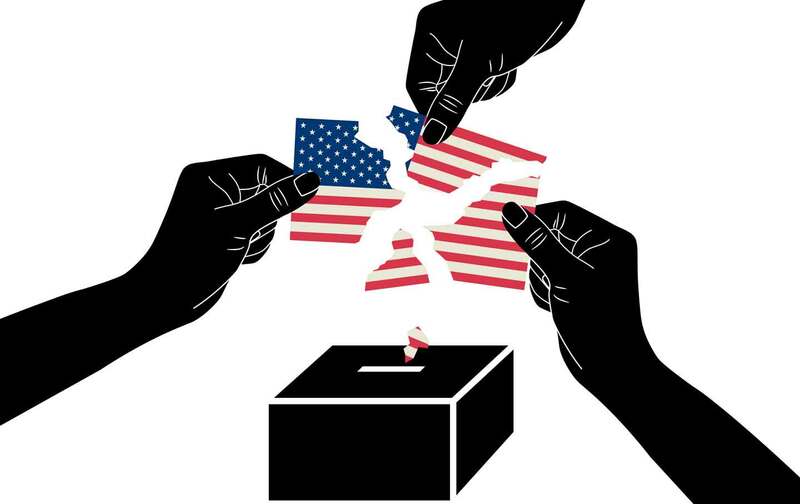 What are the prospects for a realignment of American politics? On the Democratic side, practically nil. The presidential front-runner—the one with the endorsements of 15 out of 18 sitting Democratic governors, 40 out of 44 senators, and 161 out of 188 House members—is running a campaign explicitly opposed to fundamental transformation. Her signature campaign promise—no new taxes on households making $250,000 or less—renders serious change impossible. The chance for her opponent to win the nomination approaches mathematical impossibility. He is running as a “revolutionary.” But governing is a team sport. If, by some miracle, Bernie Sanders entered the White House in January, he would do so naked and alone—in command of a party apparatus less prepared ideologically, institutionally, and legislatively to do great things than at any other time in its history. One side promises competence. The other promises the impossible. This is the Democratic Party in 2016. And the Republicans? Senator Ted Cruz, believe it or not, was also a candidate of continuity, the nearly pure product of a conservative-movement Petri dish. His father was an evangelical pastor from one of America’s most reactionary immigrant communities. Cruz received his tutelage in the thought of Milton Friedman and Frédéric Bastiat while still in high school; he also memorized the US Constitution, was a champion debater at Princeton, and worked as the conservative movement’s all-but-official Supreme Court litigator in his years as solicitor general of Texas. His creepy extremism is precisely the extremism we have known in the Republican Party ever since Barry Gold- water in 1964. His electoral coalition was Goldwater’s—which, blessedly, in our increasingly younger, browner, and leftward-leaning nation, means it was always going to be very hard for him to become president. That leaves our orange-maned wild card—who, for the same reasons, will also have a very hard time winning a presidential election. But if there is any chance of a fundamental realignment in American politics, it would come from the candidate to whom none of the familiar rules apply. Donald Trump has primed millions of his followers to believe that a corrupt national establishment—a conspiracy of politicians, the media, and business—has stolen their birthright as Americans. The techno-sociology scholar Zeynep Tufekci, studying Trump’s social-media following, notes that his fans treat him as the sole source of truth and authority: In their view, “every unpleasant claim about Trump is a fabrication by a cabal that includes the Republican leadership and the mass media.” Recently, Robert Costa and Bob Woodward of The Washington Post asked Trump what he would do in his first 100 days as president. The candidate replied that he would focus on trade deals. “What about economic legislation?” Costa asked. Trump responded, “Before I talk about legislation, because I think frankly this is more important—number one, it’s going to be a very big tax cut.” He spoke, in other words, as if tax policy isn’t a product of legislation, but rather gets handed down by presidential fiat. If Trump wins the presidency, we’ll have elected an aspiring dictator. In that event, speculation about the fate of the conservative movement, let alone the Republican Party, would be quite beside the point. But if Donald Trump loses the presidency, we’ll still be left with those millions of followers—many of them violent—trained by Trump to believe that their American birthright has been stolen from them once more. The only thing that will stand in their way is the strength of our constitutional system. One must hope it proves very strong indeed. The alternative is a sort of realignment that none of us want. Democrats and republicans will likely spend the coming decades as they have the last eight: fighting over the legacy of the New Deal, respectively defending and assailing its commitments to a robust welfare state and a mixed economy. In his 1944 State of the Union address, Franklin D. Roosevelt called for a Second Bill of Rights guaranteeing access to employment, housing, medical care, and education. A conservative coalition of Republicans and Southern Democrats stopped those plans in their tracks. Yet far more than in FDR’s time, the parties are divided sharply over his vision. That is likely to continue, whatever the shape of things to come. Early in the Reagan era, James L. Sundquist, an influential scholar of partisan realignment, observed that “when the New Deal alignment is strengthened, the New Deal coalitions are weakened.” These fissures have only grown starker: The Roosevelt coalition broke apart as liberals and conservatives sorted between the parties. Minorities and “pink-collar” workers supplanted white Southerners and Northern ethnics in the Democratic fold. Party coalitions, now oriented largely around race, fight pitched policy battles around class. The Democratic Party has embraced a version of what Northern liberals hoped for in the postwar era—a party more diverse in its leadership and no longer cemented to the male family wage. With their own house largely in order, the New Dealers’ proverbial grandchildren watch with both fascination and horror the lurid spectacle of a Republican Party whose contradictions have, in the unlikely figure of Donald Trump, finally come to the fore. That upheaval has loosed from their moorings three very different blocs of voters. Their allegiances, once the dust settles, will determine the balance of power in American politics. If Trumpism prevails and the Republican Party becomes principally a vehicle for white nationalism, Democrats will welcome the refugees: affluent suburbanites who tend to be socially tolerant but skeptical about redistribution. For Democrats, such a coalition could bring back congressional majorities, but they would be unwieldy ones. A party swollen with economic elites would bring to the fore the vexed politics of revenue: Expanding programs for the Democrats’ disadvantaged constituents would cost the wealthier ones dearly. The usual work-arounds— employer mandates, tax credits, and the like—make it even harder to enact public programs further down the road. If the Republicans retreat into a familiar shell that appeals only to the likes of Ted Cruz, the less-bigoted white losers from economic dislocation might switch to the Democrats. With congressional majorities supporting redistributionist policies, this new coalition could create a new class politics built on Rooseveltian universal programs, largely redeeming the New Deal’s unfulfilled promises. Finally, if the Republicans’ existing power centers—K Street and the Koch boardroom—maneuver successfully to defeat the insurgency, the plutocrats will retain control of the party’s apparatus and agenda, even as they redouble their efforts to diversify its base, marketing aggressively to Latinos and Asians. Unfortunately for them, as the 2016 campaign has shown, the Republican base has other ideas. Yet even if the presidency remains out of reach, the party’s leaders might well be content to control the national purse strings in the House of Representatives and sow tensions among Democratic constituencies whenever priorities conflict: housing versus healthcare, young versus old, race versus class. Given the pyrotechnics of 2016, these prognoses may seem mundane. A fundamental realignment along the lines of 1860, 1896, or 1936, however, would require not just movement in a few voter blocs or on issues such as trade, but a change in the basic divide between the parties’ competing positions. That’s a remote prospect. The New Deal still casts a long shadow, and party politics will likely remain a battle over the size and scope of government. Danielle AllenDanielle Allen, the UPS Foundation Professor of Social Science at the Institute for Advanced Study in Princeton, has published books on ancient Greek politics and citizenship in contemporary democracies. She is finishing a book on the Declaration of Independence.